Jean-Francois Raffaelli original etching "Sous la pluie"
Medium: original etching and drypoint. Catalogue reference: Delteil 86. 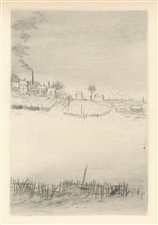 This lovely drypoint was executed by Raffaelli in 1909 and published in Paris by H. Floury. Plate size: 3 1/4 x 4 5/8 inches (85 x 118 mm), on wove paper. Not signed. Condition: some age-toning and minor soiling to the margins. Jean-Francois Raffaelli original lithograph "Un grand electeur"
Medium: original lithograph. This impression is from the rare 1897 portfolio "Art et Nature" by Leon Roger-Miles, published in Paris by Boudet in an edition of 525. Printed in blue-gray ink on Marais wove paper, the sheet size is 12 3/4 x 9 1/2 inches (325 x 240 mm). Signed in the plate, not by hand. Jean-Francois Raffaelli original etching "Au coin de la route"
Medium: original etching and drypoint. Catalogue reference: Delteil 88. Executed in 1909 and published in Paris by H. Floury. Plate size: 7 3/4 x 6 inches (198 x 155 mm), on wove paper. Signed by Raffaelli in the plate (not by hand). Jean-Francois Raffaelli original etching "La Neige (soleil couchant)"
Medium: original etching and drypoint. Executed in 1909 and published in Paris by H. Floury. Plate size: 8 1/4 x 5 5/8 inches (212 x 143 mm), on wove paper. Not signed. Medium: original etching and drypoint. Catalogue reference: Delteil 86. Executed in 1909 and published in Paris by H. Floury. Plate size: 5 3/4 x 8 3/4 inches (145 x 223 mm), on wove paper. Not signed. 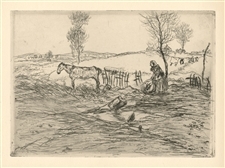 Jean-Francois Raffaelli original etching "Le Remouleur"
Medium: original etching and drypoint. Catalogue reference: Delteil 76. Executed in 1909 and published in Paris by H. Floury. Plate size: 8 3/8 x 6 1/2 inches (212 x 165 mm), on wove paper. Not signed. Jean-Francois Raffaelli original etching "Le Marchand D’Habits"
Medium: original etching and drypoint. Executed in 1895; catalogue reference Delteil 24. This impression on laid paper was printed in 1895 for Gustave Geffroy's "La Vie Artistique". Plate size: 5 1/2 x 3 3/4 inches (145 x 95 mm). Signed in the plate, not hand-signed. Condition: there is some creasing in the margins. 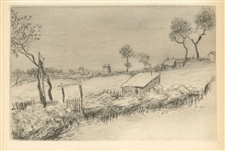 Jean-Francois Raffaelli original etching "La terrain perdu"
Medium: original etching and drypoint. Catalogue reference: Delteil 16. Executed in 1909 and published in Paris by H. Floury. Plate size: 5 1/2 x 7 3/4 inches (142 x 197mm), on wove paper. Not signed.